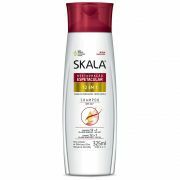 A linha Skala 12 em 1, enriquecida com vitamina E e D’Panthenol, possui uma restauração espetacular e nutrientes vitais com propriedades que agem diretamente nos fios para combater os principais sinais de danos. 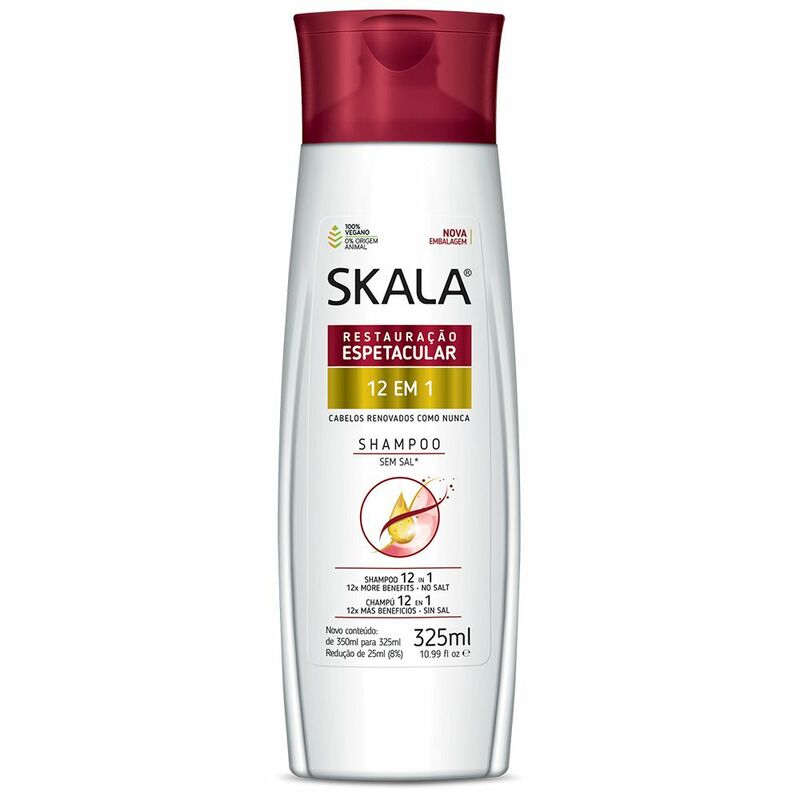 Shampoo 12 em 1 para cabelos danificados. Aqua, Sodium Laureth Sulfate, Cocamidopropyl Betaine, Glycol Distearate, PEG-90M, Ammonium Chloride, Polyquaternium-10, Parfum, Guar Hydroxypropyltrimonium Chloride, Disodium EDTA, Methylchloroisothiazolinone (and) Methylisothiazolinone, Citric Acid, Tocopheryl Acetate, Panthenol, Argania Spinosa Kernel Oil, Persea Gratissima Fruit Extract, Phenyl Trimethicone, Hydrolyzed Corn Protein (and) Hydrolyzed Soy Protein (and) Hydrolyzed Wheat Protein, Laureth-2 (and) Myreth-2 (and) Octyldodecanol (and) Cetyl Lactate (and) Prunus Amygdalus Dulcis Oil (and) Zea Mays Oil (and) Gossypium Herbaceum Seed Oil (and) Helianthus Annuus Seed Oil (and) Triticum Vulgare Germ Oil (and) Persea Gratissima Oil (and) Phospholipids (and) Squalene (and) Glyceryl Linoleate (and) Glyceryl Linolenate (and) Tocopheryl Acetate, PEG-75 Shea Butter Glycerides, Theobroma Cacao Extract, Hydrolyzed Rice Protein, Hydrolyzed Wheat Protein, Saccharum Officinarum Extract, Methicone (and) Carbocysteine, Linalool.